The Andean Horror Film Fest offers Vancouverites some of the most interesting independent horror films produced in the Peruvian Andes. The films (2002 – 2005) are audiovisual adaptations of local Andean folktales, featuring such mythological monsters as the Jarjacha (a part man-part llama demon), the Pishtaco (the White assassin), and the Kharisiri (the evil shaman). By merging folklore and genre, their narratives explore social insecurities, political climates and aspirations, as they resonate with the aftermath of the internal armed conflict that shook Peru (1980-2000). The festival screens 2 feature-length films, 1 experimental/gore medium-length film (free screening), and 1 documentary short (free screening). On the closing night, María Cecilia Saba will be hosting the panel discussion “Horror in the Andes,” with Rachel Fox (Programmer at the Rio Theatre), Ronnie Dean Harris (Director of the Vancouver Indigenous Media Arts Festival) and Ana Maria Carrizales (Peruvian Actress, Filmmaker and Producer). 5:00 pm – The Curse of Jarjacha. Director: Palito Ortega Matute. Running time: 93 minutes. 7:00 pm – The Other Cinema. Directors: Sofia Velasquez and Javier Becerra. Running time: 28 minutes. 5:00 pm – The Mystery of the Kharisiri. Director: Henry Vallejo. Running time: 123 minutes. 7:30 pm – Pishtaco. Director: Jose Antonio Martinez Gamboa. Running time: 75 minutes. 5:00 pm – Pishtaco. Director: Jose Antonio Martinez Gamboa. Running time: 75 minutes. 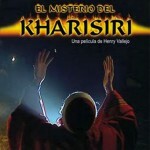 7:00 pm – The Mystery of the Kharisiri. Director: Henry Vallejo. Running time: 123 minutes.